Mobile, compact & convenient. Caddies increase storage volume within the user’s immediate reach. Rolling pedestals such as the T-Caddy are important auxiliary pieces for non-assigned workspaces or for team and project work. Flexible, actively mobile and above all, individual customisable – these are the distinguishing marks of rolling pedestals. Formally convincing with their autonomous design, they can be structured with different top features. Four basic types in two widths and two heights. The rolling pedestals are available either open or closed with tambour, drawers or hinged doors. T-Caddies offer customisable storage and refined top features. 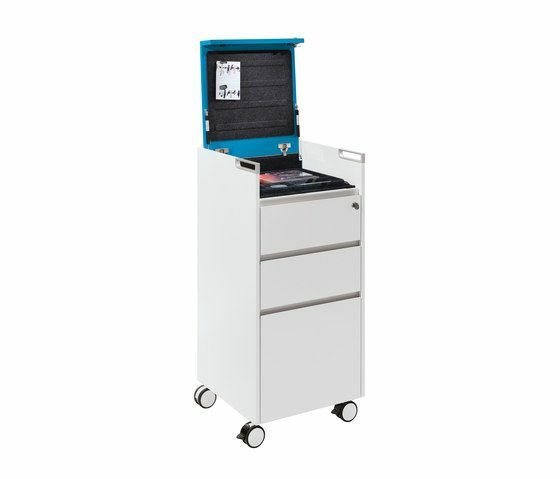 With boxes, flaps, organisation rails, shelves and upholstered seating surfaces, the T-Caddy can be adjusted to meet the user's needs and securely store your things.